Artistic coordinators: Stavros Gasparatos (composer, sound artist), Tassos Kanellos (Dipl Architect, MSc Computation), Dr. Anna Laskari (Dipl Architect, MPhil Architecture, MSc Computation, PhD). The Alternative Stage of the GNO organised a practice-based research workshop, under the title Music Theatre Lab, which examined the relationship between music theatre and the technology of sound and image. The Alternative Stage of the GNO invited 30 artists of minimum 18 years of age from the following disciplines: music theatre, music composition, sound art, electronic music composition, visual arts, graphic design, architecture, scenography, lighting design, photography, film, animation and relevant disciplines. The Music Theatre Lab explored the sonic, spatial and visual potential of the Alternative Stage of the GNO through the application of Digital Arts, Interactive Media and Programming. 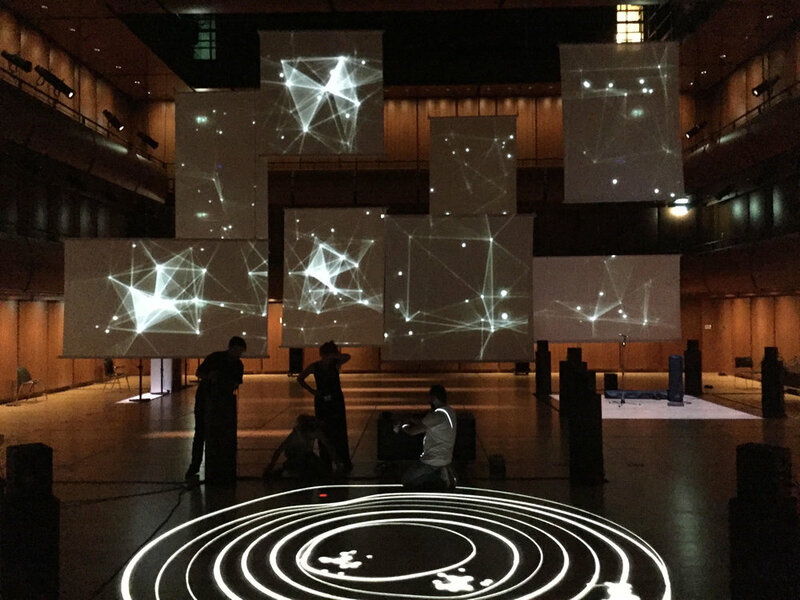 Participants worked intensively within the GNO Alternative Stage space at SNFCC aiming to create an interactive, audiovisual installation, specifically designed for the Alternative Stage. The Music Theatre Lab will consist of two working groups, with one focusing on the sonic and the other on the visual aspect of the project. The two groups worked collaboratively with the aim to produce a common audiovisual installation, was presented at the GNO Alternative Stage at SNFCC, right at the end of the Music Theatre Lab.